INGREDIENTS: Rice Flour, Dark Soft Brown Sugar [Raw Cane Sugar, Cane Molasses], Potato Starch, Maize Starch, Ginger, Cinnamon, Stabiliser (Xanthan Gum), Icing Sugar, Jelly Beans (4.5%) [Sugar, Glucose Syrup, Maize Starch, Water, Citric Acid, Flavouring, Malic Acid, Glazing Agents (Shellac, White Beeswax, Carnauba Wax), Fumaric Acid, Acidity Regulator (Sodium Citrates), Fruit And Vegetable Concentrates [Carrot, Pumpkin, Radish, Apple, Blackcurrant, Spirulina], Caramelised Sugar]. 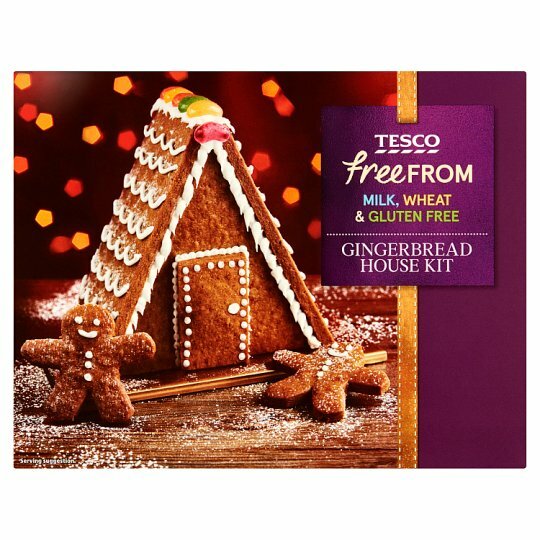 You will need:For the Gingerbread: 60g dairy free spread (or unsalted butter or margarine) and 75ml (5 tbsps) golden syrup.For the Icing: 20ml (4 tsps) water.1. Preheat the oven to 180°C/Fan 160°C/Gas 4 and grease and line a baking sheet (approximately 25cm x 35cm).2. Carefully unfold the box and place sheet of greaseproof paper over each of the templates that are printed on the inside of the box. Trace around each the shape and cut out to use as a stencil.3. Melt the golden syrup and dairy free spread (or unsalted butter or margarine) in the microwave for 30-40 seconds (800W).4. Empty the gingerbread mix into a bowl. Pour the melted mixture into the gingerbread mix and stir together. Once the ingredients are combined use your hands to knead the dough into a soft ball.5. Roll out the gingerbread in between two sheets of clingfilm to approximately 3mm thick. Remove the top layer of clingfilm. Place the stencil over the gingerbread and cut around. Repeat until you have 2 rectangles, 2 triangles and a gingerbread man. Use the left over dough to make a door and another man. Place the gingerbread shapes on the baking tray.6. Bake in the oven for 15 minutes. Once baked, make sure that the edges of the shapes are straight, if not, trim any excess off while warm. Leave on the trays to cool.7. Carefully open the icing sachet into a bowl and stir in the water. Once the icing is smooth, pour into the empty sachet, cutting a small hole in one corner of the sachet.8. Once the gingerbread is completely cool ice along edges of the rectangles and one of the triangles. Stick the triangle and side pieces together, hold in place for about 30 seconds.9. Attach the back triangle, holding in place for 30 seconds. Finally, attach the door to the front of the house.10. Use the rest of the icing and jelly beans to decorate the gingerbread house.